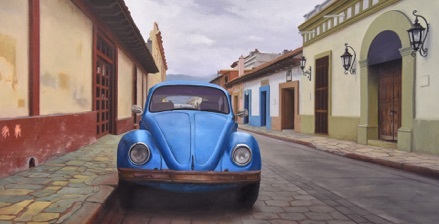 The Iconic shape of the Volkswagen Bug is the focal point of these paintings. Over the past two years Duce has spent several months in Chiapas, Mexico where he was inspired by the unique range of vintage VW Bugs and their visual relationship to the streets and organic architecture of the mountainous villages. Duce created the paintings in small format to achieve an intimate jewel-like quality that expresses the color and atmosphere typical of the Chiapas region. The paintings range in size from 8 x 8 inches to 20 x 20 inches and are all painted in oil on wood panel. This series has expanded and Duce is now working in larger formats and exploring new compositions.